In a landslide, Guardian wins 2011 ‘Dishonest Reporting’ Award! This is cross posted by our friends at HonestReporting. 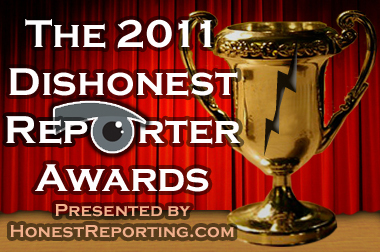 HonestReporting readers were asked to choose this year’s Dishonest Reporting Award, and they spoke out — with a vengeance we haven’t seen for nominations in previous years. In comments on our website, our Facebook community, and in emails, accusations of anti-Semitism turned the heat up on an annual discussion normally about imbalanced stories, spin games, and journalistic naiveté. The Guardian’s skewed news and commentary have a wide reach. In May alone, its web site drew in 50 million unique readers. This paper systematically dislikes Israel. The sheer volume of The Guardian’s deliberately vicious output in 2011 necessitated a top 10 list of reasons it deserves the 2011 Dishonest Reporting Award. Never mind that the disproportionate nature of the exchange was at the insistence of Hamas, or the fact that choseness actually refers to responsibility, not superiority. HonestReporting was copied in on more than 500 complaints to The Guardian. The result? Orr made a mealy-mouthed apology, but readers’ editor Chris Elliott acknowledged the presence of anti-Semitism in The Guardian, but didn’t directly judge Orr. Elliott appeared more concerned about the effects of anti-Semitism on the paper’s reputation than about the anti-Semitism itself. When any paper’s public editor acknowledges anti-Semitism, that should raise red flags. PLO documents on a decade of peace talks (The Palestine Papers, a.k.a. PaliLeaks) were leaked to The Guardian and Al-Jazeera. But the revelations — that Israel was actually serious about peace — sorely disappointed the editors. The Guardian also gave an op-ed platform to the Hamas chief of international relations, Osama Hamdan (more on the issue of giving an editorial soapbox to terror below) and published a controversial letter by Ted Honderich which legitimized and justified Palestinian terror. Thatletter sparked such outrage, readers’ editor Chris Elliott was compelled to weigh in — ultimately defending the decision to publish it. Palestinian reconciliation efforts were on and off (mostly off) throughout the year. At one point, The Guardian gave Hamas spinmeister Musa Abu Marzuq the legitimacy of an op-ed soapbox. Legally speaking, it would seem that there is not much difference between outlaw regimes like Iran and Syria, which illegally provide material support and resources to terrorist organizations, and liberal media outlets which provide millions of dollars in free advertising and access to groups like Hamas when they publish their leaders’ dangerous messages. As mentioned above, The Guardian also gave a soapbox to Osama Hamdan who discussed the Hamas response to the PaliLeaks affair. Correspondent Harriet Sherwood spent a day in July reporting and tweeting from a Gaza fishing boat testing the Israeli navy’s enforcement of a three-mile limit. None of Sherwood’s 46 tweets acknowledged maritime arms smuggling as the reason for the naval restrictions. Four months before the jolly jaunt, the Israeli navy intercepted the Victoria, which was carrying anti-ship missiles, mortar shells, radar systems, and more. Considering that Sherwood’s ditzy 2011 journalism included a claim that the Knesset is built on the ancestral farmland of the abandoned Palestinian village of Lifta (we debunked that false claim), and an airheaded look at an abandoned airplane (resolved by a reader’s biting comment), be thankful The Guardian left the Victoria story for AP. In a Washington Post op-ed, Judge Richard Goldstone backtracked on the UN report into Operation Cast Lead which he headed. His mea culpa specifically stated, “civilians were not intentionally targeted as a matter of policy” and accepted that the casualty figures were not as high as his report indicated. The Guardian reacted with an arrogant, intellectually dishonest staff editorial denying that the Goldstone report ever accused Israel of deliberately attacking civilians in the first place. As for the casualty numbers, the paper insisted on using the inflated casualty figures Goldstone disavowed — without explaining why. HonestReporting took apart that editorial in more depth. Palestinians claimed that Jawaher Abu Rahma died of tear gas inhalation at a demonstration in Bil’in. Harriet Sherwood’s coverage compared Abu Rahma to Mohammed al-Dura, the 12 year-old Palestinian whose video (itself debunked) elevated the boy to iconic martyr status. Her report was also accompanied by Abu Rahma’s Red Crescent emergency case form, a CT scan and hospital report. Lay readers can’t be expected to understand the meaning of these reports, but they did serve The Guardian’s purpose: disingenuously blaming Israel. The Palestinian medical report indicated no clear cause of death. Statements about tear gas inhalation were based on the family’s claims, not on any empirical determination. In fact, an IDF investigation found that Abu Rahma died because of Palestinian medical malpractice. Reporter Ana Carbajosa published a Jan. 9 puff piece interview with Abu Rahma’s mother giving further credibility to the Palestinian accusations. Jerusalem correspondent Harriet Sherwood displayed some of the groupthink we long suspected goes on at The Guardian with one unusually long and shrill telephone conversation in May. The topic: Vittorio Arrigoni, a member of the International Solidarity Movement in Gaza who was kidnapped and murdered by Palestinian Salafists. Was it fair to label Arrigoni as an “activist?” There was a lot of debate. After the Jewish Chronicle published one forceful commentary, JC editor Stephen Pollard received a phone call from a very irate Sherwood. I pointed out again that I don’t agree with all the columns in the JC. ‘Of course I am. I edit the paper.’ I replied. There’s more, but you get the full drift. Utterly bizarre. Or maybe not, given what she writes in the Guardian. The Palmer panel’s finding went against every statement the UN secretary-general has made about Gaza, the Goldstone report and a report by the UN human rights council in September. If, as Palmer found, the siege is legal in international law, the occupation is too. This must be challenged in court. Does The Guardian tolerate no dissent from its warped worldview? Must it obtain court rulings validating every criticism of Israel? A print edition op-ed by Greg Philo, the research director of Glasgow University Media Unit, claimed to quantifiably prove that Israeli spin doctors have hijacked the Mideast narrative in media coverage. HonestReporting addressed the commentary in more detail, pointing out, among other things, that A) Philo ignored hundreds of rockets fired during the course of a six-month cease-fire, B) denied Israel the right to defend its citizens from terror, and C) appearances at pro-Hamas forums belie Philo’s neutral academic persona. As London boiled over in August riots, one report in The Guardian didn’t bother to mention the race, religion, or ethnicity of anyone — except for a reference to a group of Hasidic Jews jeering the police. When CiF Watch cried foul, The Guardian amended its article. All these were just 10 of the most noteworthy examples of The Guardian’s obtuse brand of journalism HonestReporting observed. On the macro level, the now-defunct Just Journalism (pdf) published a scathing report on The Guardian’s external op-eds over the first half of the year. Among its primary findings: more op-eds were published by Palestinians than by Israelis; all the Israelis given op-ed space were associated with the left-wing of Israeli politics. And three of the Palestinian contributors were either members of Hamas or strongly affiliated with it. If the readers’ editor is really concerned about al-Guardian being perceived as an anti-Semitic newspaper, Chris Elliott should have some sleepless nights when he assesses the paper’s overall Mideast content from 2011. Can the paper get any worse in 2012? Only time will tell. There can be no doubt the Guardian is running a full-blown campaign against Israel. This is not journalism, it is blatant propaganda. As has been demonstrated with monotonous regularity, the Guardian is a place where lies are told about Israel, where anti-semitism is tolerated, and where Palestinian atrocities, human rights abuses and hate-crimes go unreported. It is a source of shame that this deeply nasty newspaper is published in Britain. The Guardian has, in the last few months, stepped up its reporting about Israel, more and more frequently in pieces that allow no comment (i.e., dissent). In addition, as if the idiot Sherwood is not enough, they now have a Phoebe Greenwood contributing frequent anti Israeli pieces. Its anti-Israeli attacks seem to increase as the gloom over the Arab winter deepens. It is thus noteworthy that a piece that appeared today (http://www.guardian.co.uk/world/2011/dec/13/israeli-settlers-clash-west-bank) about the demolishing of a settlement by Israel was not filed by either of these luminaries, but was a post of an AP report. The editors in todays media should be held accountable for their incitement as Streicher was. If the Guardian is still around this time next year, they have a good chance of winning it again twice in a row, I reckon. I checked the Guardian website and can’t find any evidence that they acknowledged this prestigious award, although everyone there must be aware of it. Of course, they also know what anti-Semites and Israel haters they are, and they only rarely acknowledge that either. In any case, they have a lock on this award for as long as they continue to publish with their current writers and editorial policies. The Guardian is a nasty disgusting racist rag,you have to read their reporters tweets that show these peoples true colors.A group of pretentious A Holes. I remember contacting The Guardian when I first started working as PR officer for a Jewish NGO which had brought Arab and Jewish Israeli youth to London to learn English together. The reporter (whose name I forget) immediately – and I mean immediately – started probing the organisation’s presence in Israel: did it have projects in the Disputed Territories (not her choice of phrase)? No? Why not? Isn’t that a political statement? Everything is political! It was like being sucked into a students union debate. Tiresome. The better that life in Israel gets, the nastier this racist rags articles about Israel get. The Guardian hasn’t written ONE SINGLE positive article or thing about Israel.With all the positive things that happens in Israel this racist Guardian couldn’t find one single positive thing to say about Israel. Their cartoons and cartoonists of the Guardian sum up this nasty racist rag beautifully,the Guardian is all about bums and hot air. Can the the paper get any worse in 2112 ??????? This is great and totally deserved! You should continue to publicize the award to “out” these slimy, disgusting lying bigots, hiding behind the cloak of “journalism”.